I made this same list a couple months ago, but the other day I deleted it and decided to remake it. The list wasn’t perfect and it had to be perfect. Other than a list of my top ten favorite movies of all time, which will be coming soon, this list is the most important post I could possibly create. Villains are the backbone of the industry. Their are almost always the most interesting characters to watch and plots would go absolutely no where with out them. Films need them and I absolutely love ’em. I’ve decided to remake this list because after re-watching a couple films and even watching a few new ones, I’ve finally decided on what I’ve found to be the perfect order when it comes to film villains. I’ve moved some characters around and I’ve removed a few characters and added a few new ones. The two I removed were Roy Batty from Blade Runner and Jack Torrence from The Shining. Both are incredibly performed characters and are in some aspects more interesting than some of the characters on this list, but they’re evil for different reasons and just don’t match the caliber of villainy that each character on this film is able to reach. I’ve tried this a couple times now, but I think I’ve finally compiled the perfect list to establish my opinion on this almost impossible conundrum. So with out further review, here’s my top ten favorite cinema villains of all time in order. I hope you enjoy. 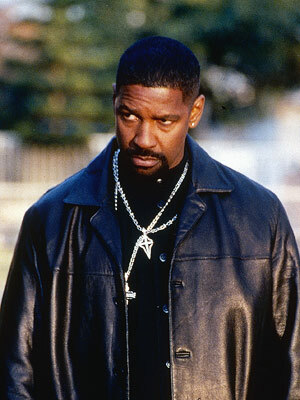 Denzel Washington received a well deserved oscar for his intense portrayal of the crooked cop, Alonzo Harris. Many films have had officers or detectives on the wrong side of the law, but no actor has ever been able to top the intensity that Washington draws from the character. In my opinion, Alonzo Harris is the most sinister cop ever put on screen. Unforgiven is in my opinion by far the greatest western I’ve seen, and one of the main reasons its so fantastic is because of Gene Hackman’s Oscar winning performance of Little Bill Dagget. He’s ruthless, brutal, and you never know what to expect, making each of his scenes very suspenseful, and he’s supposed to be the good guy. Bill Dagget is the sheriff of Big Whiskey, Utah, and its his brutal tactics to bring about justice at any cost, that makes him a villain for the books. He just barely missed my top 5. Daniel Day-Lewis is probably the greatest actor in cinema and it’s only fitting that his portrayal as the malicious Butcher; Bill Cutting, known better as Bill the Butcher. Cutting is the ruthless american born tyrant of New York 1800s in Scorsese’s masterfully made period piece. He’s played to absolute perfection by Day-Lewis, because while he is a terrible and ruthless murderer, at times it seems he even has morals. Very few though, of course. The western gunslinger known only by the name of Frank is a spectacularly menacing villain, but the thing that makes him most interesting to watch is the actor whose playing him. This was an out of the ordinary choice for Henry Fonda, a man’s whose career is full of do-gooders and family men, but in the mix of all those good guys, you’ll find one black hearted fiend and he plays him to perfection. Its his best performance and that my friends is saying something. Ralph Fiennes has a long list of fantastic villains and an even longer list of fantastic roles. His greatest role just so happens to be my fifth favorite villain. Amon Goeth is the face of evil behind the classic WWII epic Schindler’s List. He dictates the labor camp where most of the film takes place and Fiennes plays it so disturbingly well. His morning routine consists of getting up, taking a piss and shooting randon jews in the camp with a sniper. He’s sick and degenrate, and if you step out of line it becomes quite evident early on what will happen to you. It was quite hard to put Hannibal “The Cannibal” Lecter so high on this list. Most would say he deserves the top spot, and when I do see him there on other lists, I’m never disappointed, he does deserve it, I just think there’s a few qualities (for lack of a better word) that I enjoy more in my top 3. Anyways though, Lecter is probably in my opinion “the” classic movie villain. He’s sinister, intelligent and at times even courteous. He hardly ever blinks and never once does he doubt his eventual victory. It’s one of the greatest performances ever put on the silver screen and by far Anthony Hopkins’ best work. 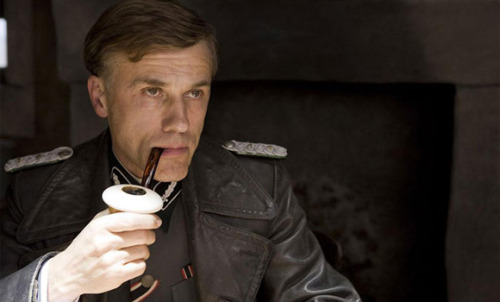 Almost all would agree that Colonel Hans Landa of the SS is an amazing villain. Most wouldn’t agree with his high placement on this list so soon after the release of the movie. Well, I’ve seen the movie seven times and I can honestly say that there is only two other villains that I enjoy more than Hans Landa. I want to point out that numbers 3 and 2 are very equally matched on this list. Landa is not your cliche nazi. He’s an intelligent and charming detective whose able to work his way through the threads of past, present and coming events so that he can assure his own gain. Nothing else matters, not even the fuhrer. He always has a plan and focus and doesn’t care who he has to step on to achieve his goals. Christoph Waltz is absolutely breathtaking in every single one of his scenes. He is one of the most evil villains ever put on screen, but its so entertaining to watch every single thing he does, whether that be drinking a glass of milk or strangling a person to death. Silent, creative, intelligent, confident, determined, arrogant (but for good reason), and above all else, evil. These are just a few of the words that can define the ruthless killer that is Anton Chigurh. His weapons of choice include a cattle gun, hand cuffs, and even a sawed off shot gun with a foot long silencer. Chigurh always has an innovative way to get what he wants and he will never stop. At one point, he decides the fate of man’s life by the flip of a coin. He’s not insane as some might call him though, he’s just nothing else, but his own gain. Killing doesn’t phase him at all. He views everyone he meets as a worthless victim. Anton Chigurh is basically the definition of a villain. Heath Ledger’s Joker is by far the greatest villain ever put on the silver screen. Not only that though, I believe the Joker is the most entertaining and interesting character ever and the greatest performance by any actor I’ve ever seen. The Joker is bent on creating chaos in a world he believes desperately needs it. He doesn’t want anything else, especially not money. He just wants to watch the world burn and he wants to be the cause. All he really wants is to have a blast. He’s always one step ahead and even if something goes wrong in his plan, he just laughs it off, it just adds to the thrill. There are many times when he has the chance to kill his nemesis Batman, but he doesn’t take them because he’s one of the few villains who release that they need each other, without Batman, the world would just seem dull. Batman won’t kill him either though because it’s wrong and he knows it’s exactly what he wants. When faced with the Batman’s speeding Bat-pod The Joker insists on him to hit him and when The Joker is thrown off a building he laughs hysterically the entire way down. He’s willing to die to show the worlds true colors. The Joker is the epitome of evil. This entry was posted in All, Film Top Ten Lists and tagged Alonzo Harris, Amon Goeth, anthony hopkins, Anton Chigurh, Best Movie Villains, Best Movie Villains of All Time, Best Villains, Bill the Butcher, Christoph Waltz, Col. Hans Landa, Daniel-Day Lewis, Denzel Washington, Frank, Gene Hackman, hannibal lecter, heath ledger, Henry Fonda, javier bardem, kevin spacey, Keyser Soze, Little Bill Dagget, ralph fiennes, The Joker, Top Ten Movie Villains, Top Ten Movie Villains of All Time, Top Ten Villains. Bookmark the permalink. How do Little Bill Daggett and Amon Goeth even make the list?!?!? Anton Chigurh is a definite maybe. Maybe he starts the list at #10, but you’ll still have a hard time convincing the majority of the public. I’m not even a huge Star Wars fan, but how does Darth Vader not make the list??? Finally, Nurse Ratched from One Flew Over the Cuckoo’s Nest is a shoe-in on my villian list. Did you know Ralph Fiennes also played Voldemort in the Harry Potter series? impressive list… what about max cady (cape fear).. agent smith (the matrix).. or the legendary leatherface.. ?? Every one seams to forget Sergi Lopez as Captain Vidal in Pans Labyrinth. He is an absolute horror of a human being in that movie.